A step-by-step guide to easily deploying a Facebook Messenger chatbot with Python, using Flask, requests and ngrok. When done right, interacting with a computer through human language is incredibly powerful and also quite fun. Messaging and Voice-Controlled devices are the next big platforms, and conversational computing has a big role to play in creating engaging augmented and virtual reality experiences. There are a number of unique challenges to building these kinds of programs, such as: how can I make my chatbot available to the outside world? In this tutorial, you'll go through the steps required to deploy a chatbot on Facebook Messenger, which has over 1 Billion active users. You can reach an enormous audience with just a few lines of code. If you want to know more on how to turn human language into machine instructions, check out the Building Chatbots in Python DataCamp course. Note that what you won't cover in this post is how to your bot can understand what people are saying and respond appropriately. To learn more about that you should have a look at Rasa NLU, Rasa Core, and the DataCamp course that was just mentioned. Create a flask app that listens for messages sent to localhost:5000/webhook. When messages are sent on Facebook they will arrive as http requests to this URL. In addition, you will create a function called verify_webhook() that handles the initial authentication between Facebook and your app. PAGE_ACCESS_TOKEN = ''# paste your page access token here>"
the user said. Replace this function with one connected to chatbot.""" pass it on to a function that sends it.""" """Check if the message is a message from the user"""
listen at the `/webhook` endpoint"""
In the above script the VERIFY_TOKEN and PAGE_ACCESS_TOKEN variables aren't defined yet - so you will have to set these. The VERIFY_TOKEN can be any string, it is used as a kind of password to let facebook know that this server wants to receive messages. It is a good idea to use a long random string. You can do this quickly by running openssl rand -base64 32 in your terminal. Don't worry about the PAGE_ACCESS_TOKEN just yet - you will see how to get it below! Next, you will write a function that that sends a response back to Facebook Messenger using a python library called requests. In particular, you use the post() method, which creates a HTTP POST request. A POST request is the typical way to send information to a server. """Send a response to Facebook"""
The url localhost:5000 only works for requests created on the same computer as the running server. So you need to let facebook know how to reach your flask server. To do this, first install ngrok. Go to this page and install the version for your operating system. If you're on Mac and have homebrew, the quickest way to install ngrok is with brew cask install ngrok. 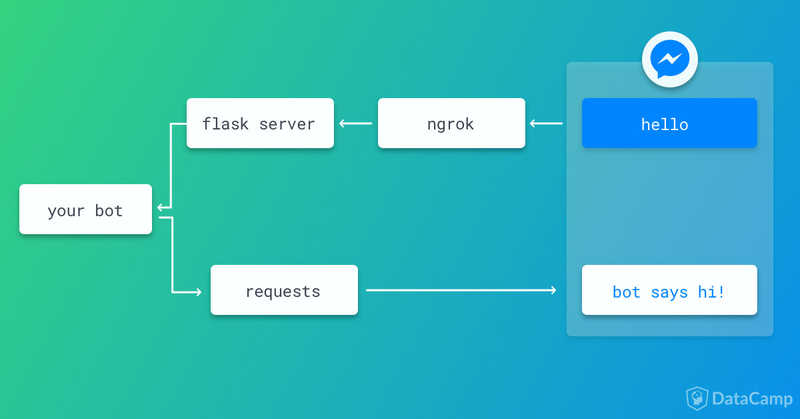 Start the ngrok server in your terminal with ngrok http 5000. This will set up a https endpoint to get forwarded to your machine on port 5000, for example https://51b6b3fa.ngrok.io. Note that if you quit ngrok and restart, this URL will change. The next step is to create an app and a page on Facebook. There is good documentation available from Facebook but you'll walk through the main steps here. Once you have created a page, go back to the Token Generation settings and select this page from the drop-down menu. Copy the Page Access Token into the placeholder for PAGE_ACCESS_TOKEN in server.py above. Finally, you need to register your webhook on the Facebook developers page. Important: Go back to Products -> Messenger, and under Select a page to subscribe your webhook to the page events select your page and click Subscribe. Your bot is now ready to send and receive messages via Facebook Messenger. Right now, your get_bot_response() function is still pretty simple, and doesn't feel like a real chatbot yet! To learn all about building chatbots, check out the Building Chatbots in Python DataCamp course, as well as the Rasa NLU and Rasa Core python libraries.